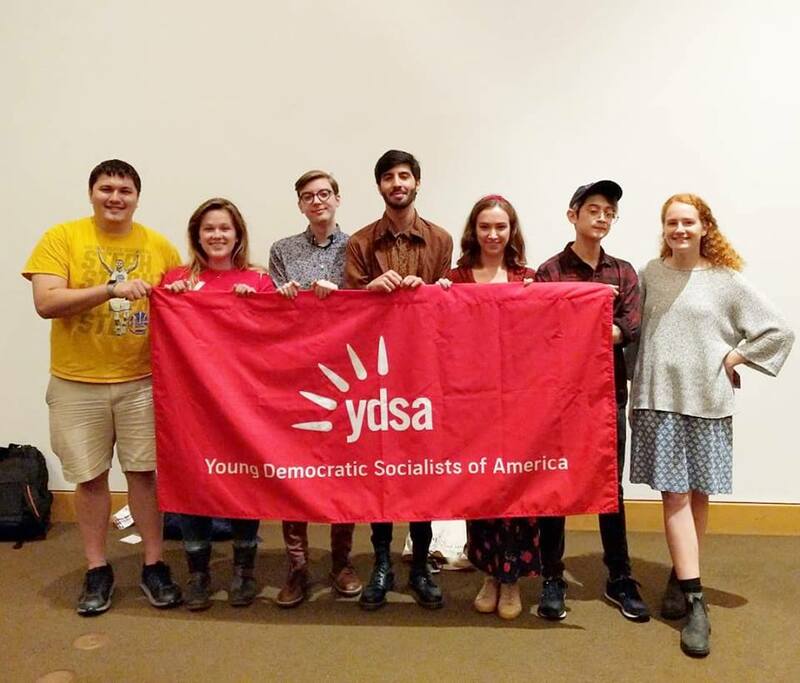 Metro Atlanta was represented at the YDSA national convention in Minneapolis Aug. 4-5 by Ga. Tech YDSA chair Nate Knauf, vice-chair Amanda Olenczuk, U. GA interim co-chair Harrison Finch, and me, Matthew Wolfsen. The convention passed five resolutions, and six individuals (including me) were elected to YDSA’s National Coordinating Committee, which is equivalent to DSA’s National Political Committee. Four of the resolutions addressed implementing strategies to advance democratic socialist causes: Medicare for All, College for All, labor union assistance/empowerment and preparing for (not endorsing) a Bernie Sanders 2020 presidential campaign. Another resolution, authored by Nate Knauf, on alternate electoral systems and countering gerrymandering didn’t pass due to a lack of an outlined strategy for organizing around the issue, but it was clear that that the conference delegates universally agreed that this was an issue to consider organizing around, and as such, I consider it to be a mandate of the body. The fifth proposal passed – written by fellow NCC member Eliott Geary but heavily supported through my amendments – is the one that I am most excited about. It establishes five regional committees, and all chapters in each region will have the right to elect a member to serve on those committees. Additionally, two more members from each region will be elected by the other members of the region to serve as their co-chairs. These regional chairs shall implement regional priorities and coordinate actions between the regional committees and the National Coordination Committee. It is my hope that this new structure will accomplish many goals, including increasing organizational capacity, creating a clear pathway to leadership, increasing solidarity between chapters of a region, creating a clear line of communication between chapters and national leadership, and establishing a “proof-of-concept” for a similar proposal which I wish to introduce at the upcoming 2019 DSA convention. It has been my opinion that as DSA rapidly grows in membership, so must its national leadership structure, and this proposal does this by involving many more of its members in national and regional decisions. As I mentioned above, I have been elected to serve on YDSA’s National Coordinating Committee. I had campaigned on a relatively simple concept: six NCC members is hopelessly too small to truly represent the wide-ranging philosophies and regional societal conditions which YDSA members face. I said during my campaign speech: “I am just one person. But together, we can change the dynamics of American society. So, I ask all of the delegates here: let’s do this together.” I hope to establish relationships with several members across all regions to ensure representation in national decisions. As always, I am indebted to the Southern region for its continued support for me, from my time serving as the caucus whip during the 2017 DSA national convention, to now, helping me in my campaign to be elected to the NCC. We must ensure that voices across all regions are represented in national decisions. I promise to ensure this includes the South as the NCC moves forward in making decisions nationally for the organization. I would like to recognize the support of the Militancy slate that endorsed my campaign. While I continue to remain averse to the idea of a slate, due to the tendency of such slates to prioritize their own platform, it’s clear to me that the individuals involved in this slate understand my concerns and will work towards a goal of collaboration among all members across all regions. Regardless of slate politics, I plan to advocate for accountability and transparency as a member of the NCC and will make suggestions to the other members to move towards that goal. I am very happy with the members who were elected to serve on the committee, all of whom were supported by the Militancy slate, and by working together I believe that we can progress in forming an organization that could significantly alter American politics by creating true material change. I want to recognize those in Atlanta who had supported me, especially Nate Knauf, Amanda Olenczuk, and all others at YDSA Ga Tech. To simply put it, I am nothing without YDSA Ga Tech. Their support for me continues to be unparalleled and I will never be able to thank them enough. Finally, I want to thank the staff members who organized the convention, especially Anna Bonomo, who lead the effort. The convention was excellently run, and I had a wonderful time in Minneapolis. To the members of Metro Atlanta DSA: I have not forgotten my responsibilities as your harassment grievance officer. I am committed to working towards building an investigatory system that is in compliance with the national policy and that implements good practices shown and used in higher education. By the end of the month of August, I will send the leadership of MADSA a memo which outlines compliance issues with the current investigatory process, including suggested policy and constitutional amendments to rectify the issues. While addressed to the leadership, the memo is intended to be released to the local membership, and, potentially, to the national membership and public to help them better understand the issues that currently exist and how to improve the investigatory system so as to eliminate such issues. I look forward to returning to Atlanta soon and continuing to work with Metro Atlanta as well as my new national responsibilities.